Lambeth English Overpiping cakes commonly have a bevel or cone made out of cake; a base approximately 4” larger than the tier of cake you will be placing on the bevel. 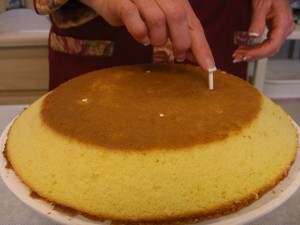 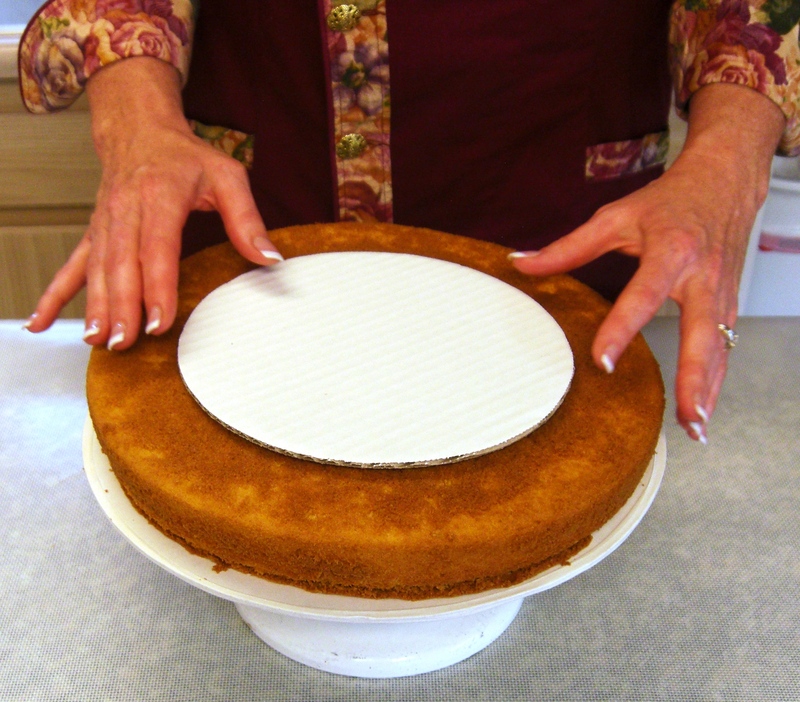 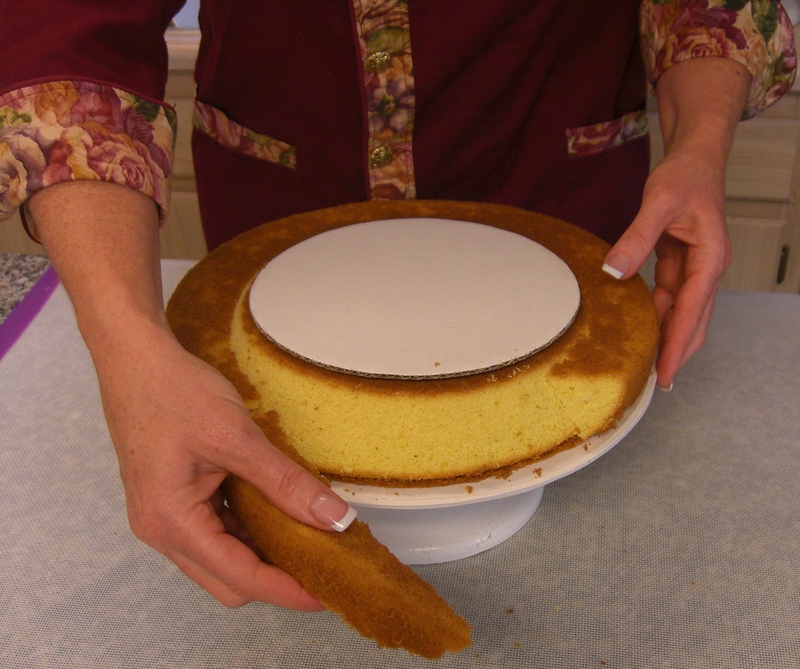 Place a 1 ½ “ high cake layer on a corrugated cake circle, the same size as the cake bevel you want to make. Place a smaller cake circle, approximately 4” smaller than the bevel and same size as the tier you will be placing on top of beveled cake. 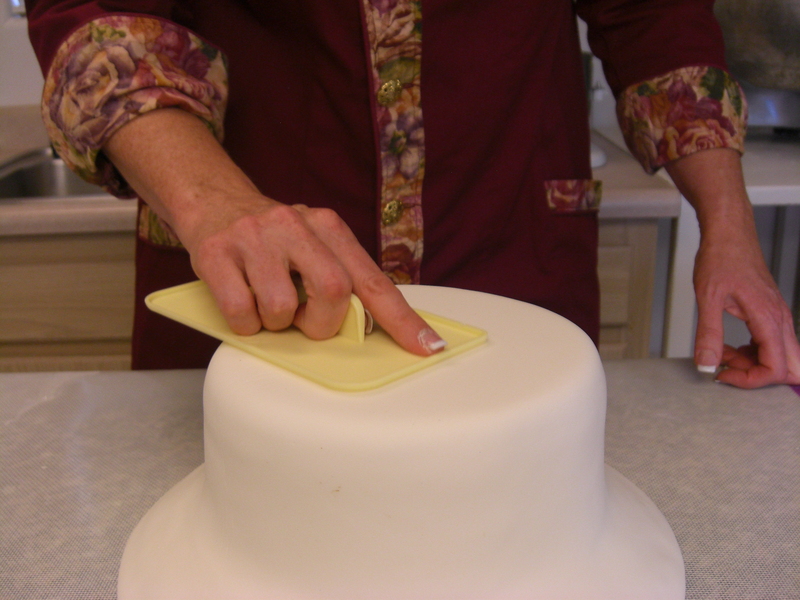 With a serrated cake or bread knife; place the knife against the top card board and cut into cake to rest the knife against the base cardboard; proceed to cut cake to make a bevel shape, making sure to rest the knife against both card boards, as shown in the pictures. 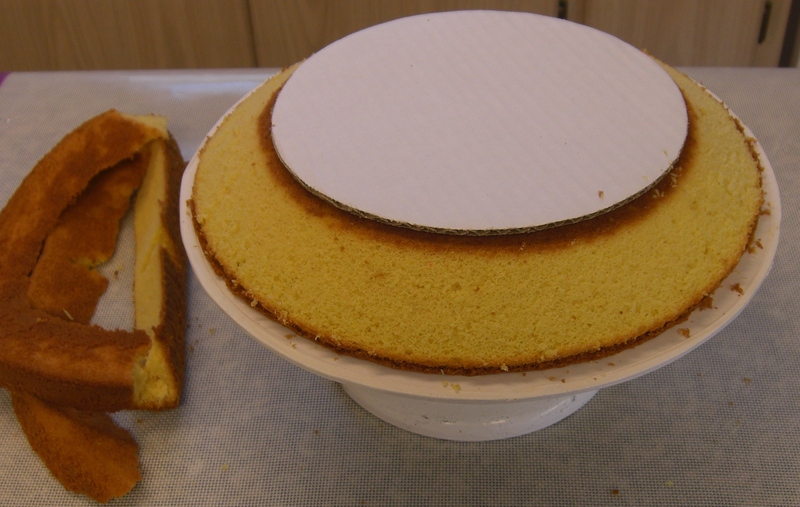 Removed excess cake and you have your bevel shape. 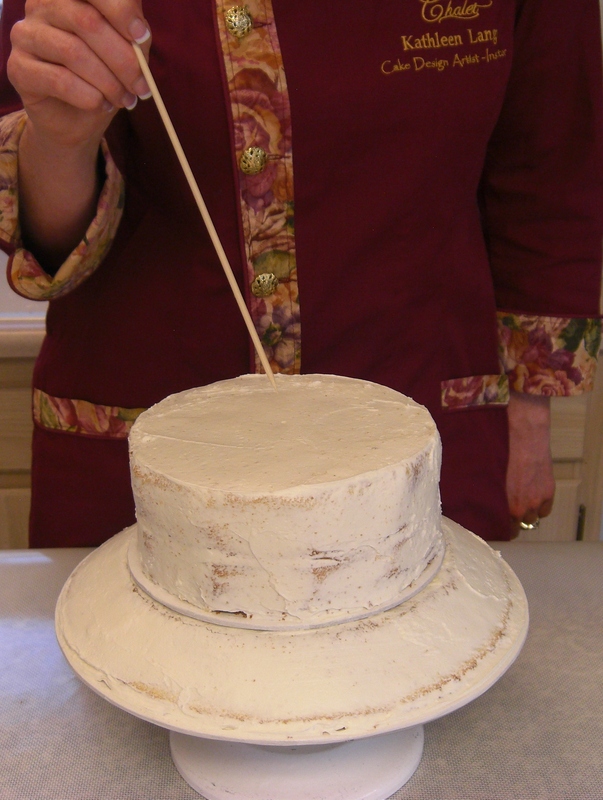 Next step add supports to your bevel cake, this will support top tier to be added; choose supports of your choice, for larger cakes use baker cake plates and supports, for a smaller cakes you may use ¼” food grade dowel rods or heavy Popsicle sticks. 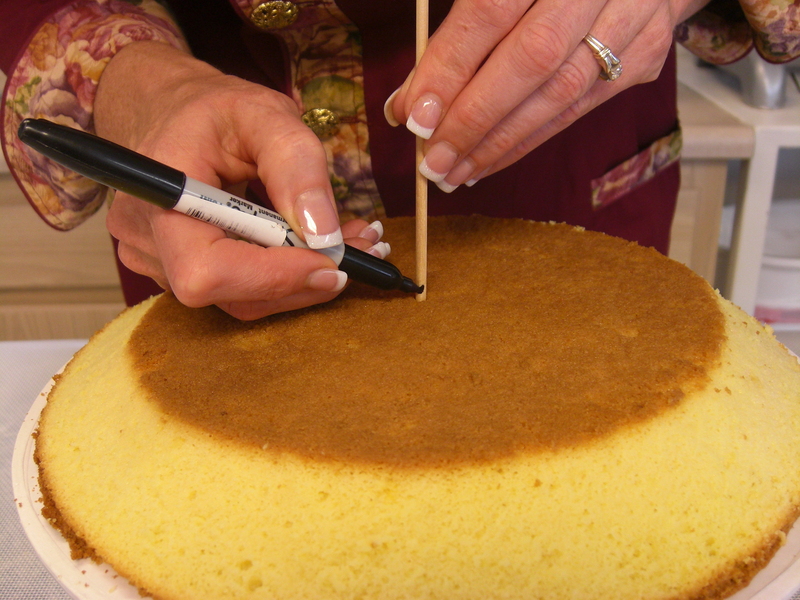 Poke one Popsicle sticks in center of cake to measure cake height, mark with a food marker proceed to cut all supports the same size. 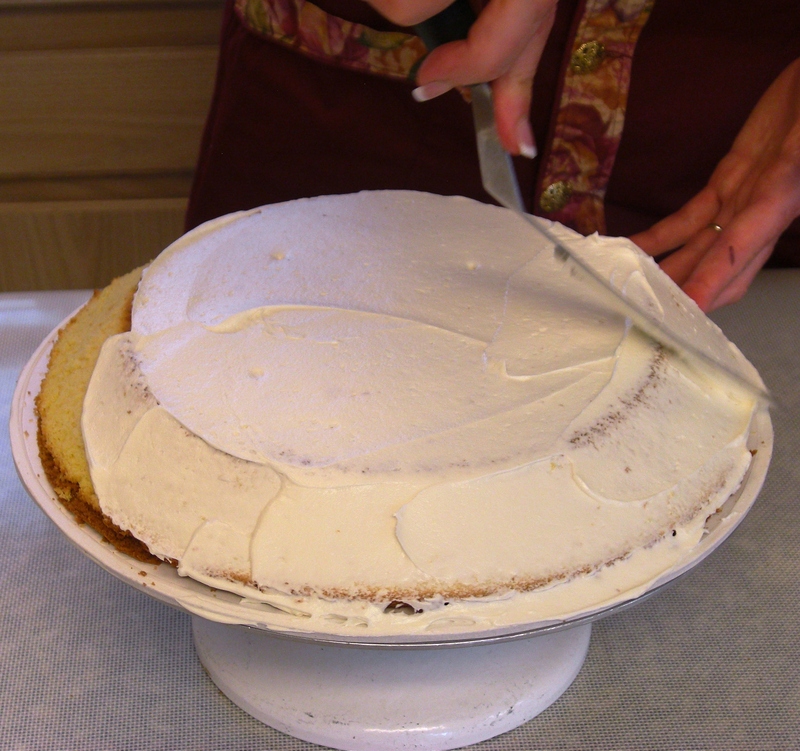 Cut at least 4 – 5 sticks to support the next layers of cake to be. Evenly space sticks, leaving the center space clear. 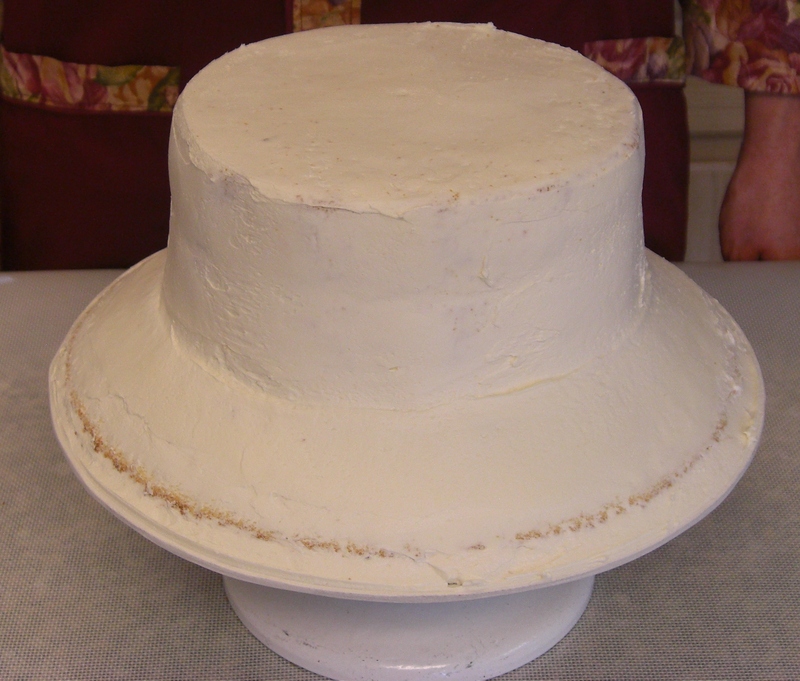 Crumb coat bevel layer with buttercream or whipped ganache. (Note: I prefer whipped ganache or a firmer and straighter side and appearance. 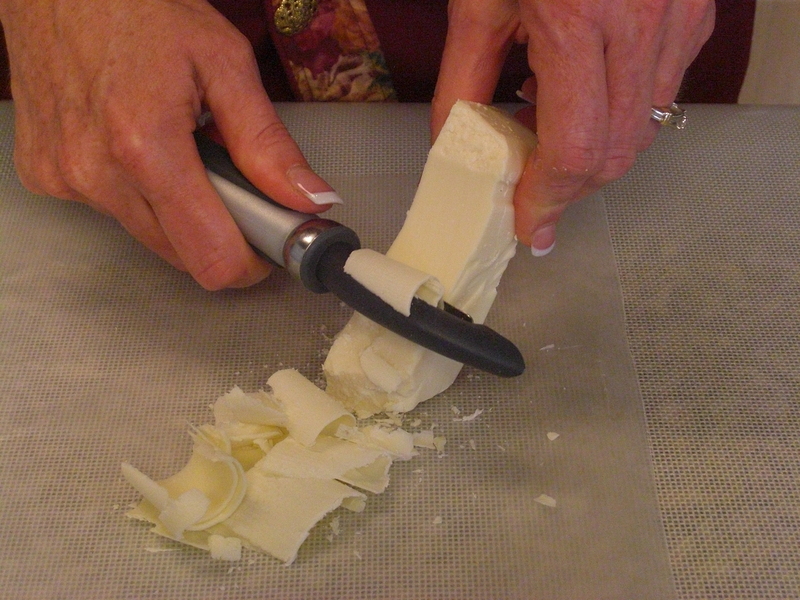 Using a potato peeler and room temp white chocolate; make white chocolate shavings to place between cake layers. 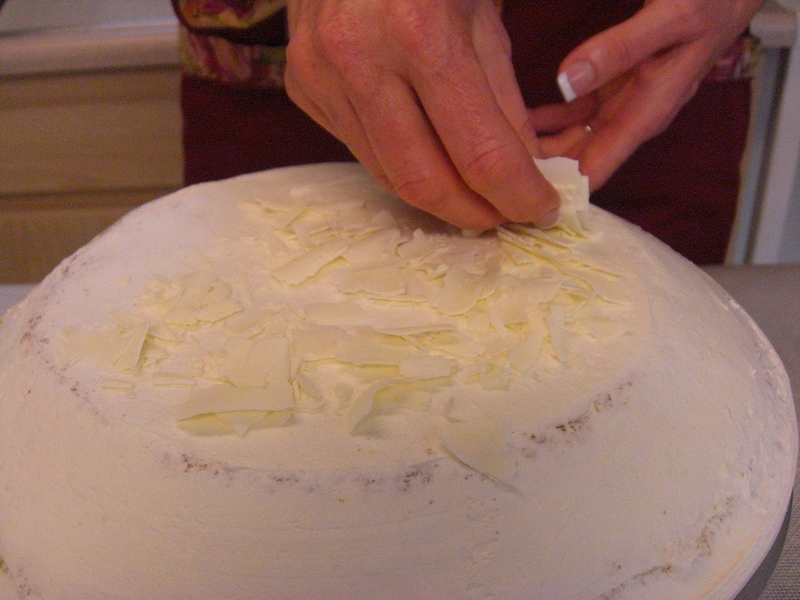 Place shavings on top of rough coated or frosted layers, to prevent top tier from removing layer of frosting when cutting cake. Place the rough coated prepared tier of cake on top of shavings; this technique will prevent the support board from sticking to the next layer, when serving the cakes. 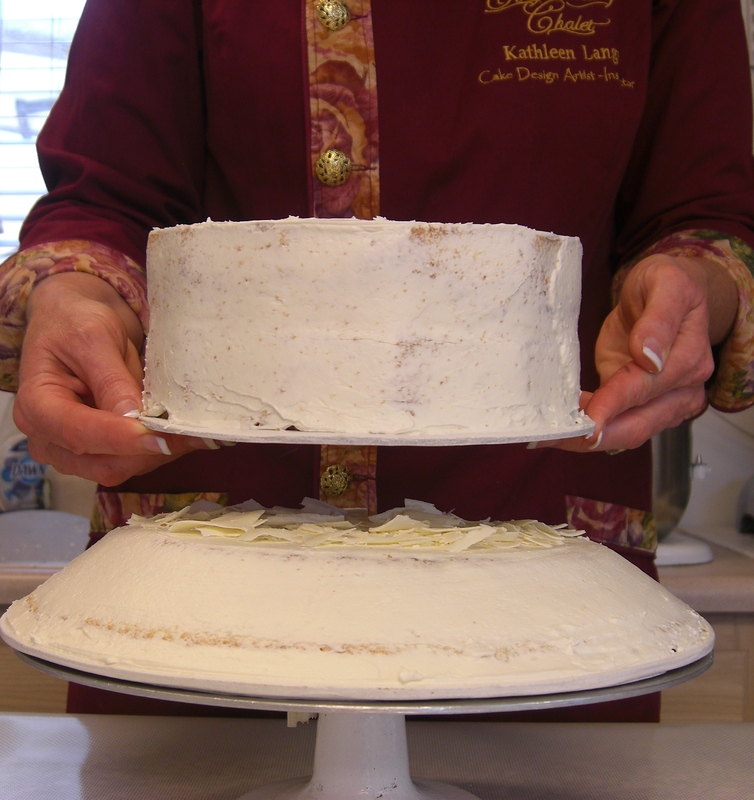 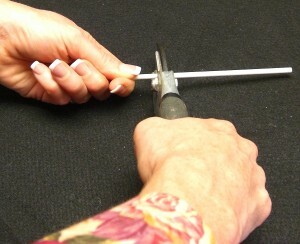 Apply more frosting to fill any imperfections and seams from placing the cake tier onto of the bevel tier. Now you are ready to finish frosting with a final coat of buttercream or whipped ganache, before covering with rolled fondant. 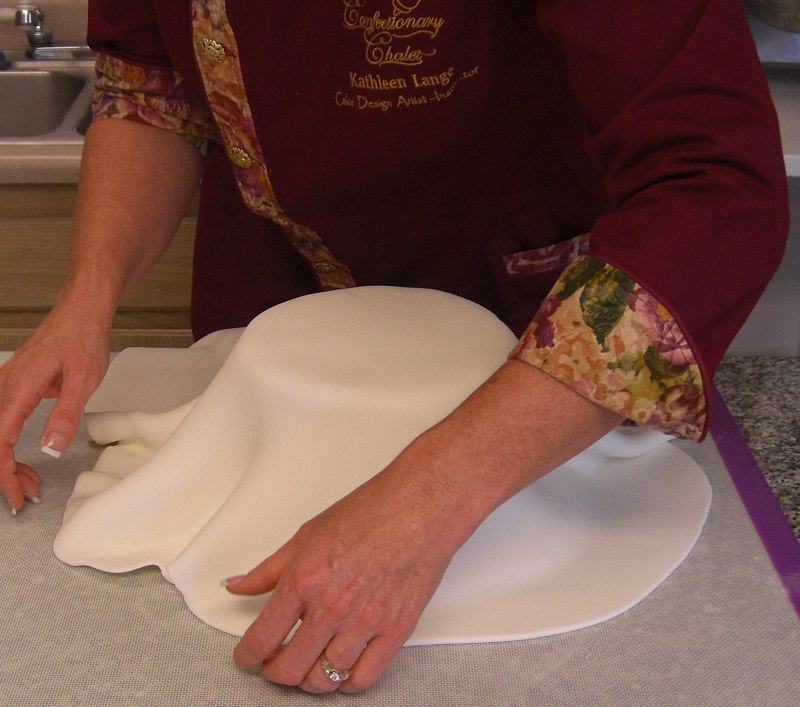 Finish by frosting with a final coat of buttercream or applying rolled fondant. 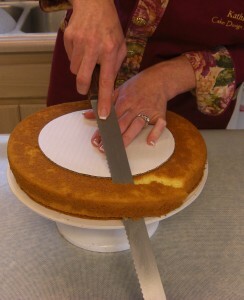 Trim excess with pizza cutter or sharp knife. 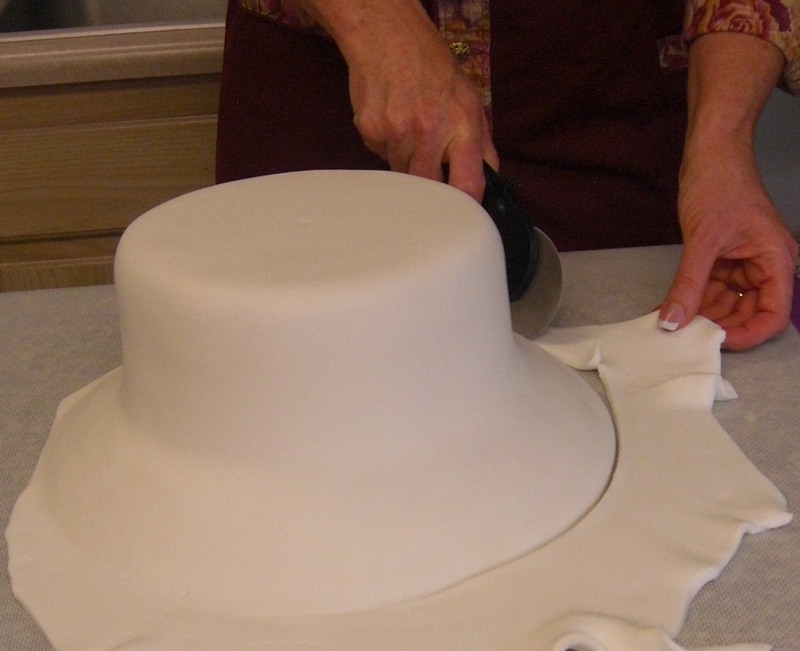 Continue smoothing with fondant smoother. 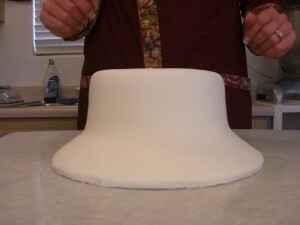 Now you are ready to attach cake to a fondant covered or decorative board and decorate.